My name is Bradley Patrick and I’m an Aircraft Technician in the Royal New Zealand Air Force. I was diagnosed with RRMS five years ago after struggling to eat a kiwifruit for morning tea. My mouth just did not want to open wide enough to let it in! A quick trip to the mirror confirmed something was amiss as the whole left side of my face had ‘slumped’! Three days’ worth of testing in hospital ended with a diagnosis of MS and me feeling somewhat upset and bewildered. I went back to work shortly thereafter and started trying to work out how to heal myself. I read a lot. Blogs and scholarly articles, along with news and sad stories. It is hard sometimes to pick the wheat from the chaff, but I came across the work of Dr Roy Swank and his low saturated fat diet. It was the first time I found something I could do to help myself. I’m a DIY kind of guy, so I jumped into the Swank protocol. I was happy to have something positive to do. I kept reading, always looking for anything else to help when I came across the OMS program. Even better than what I was already doing! Well researched and structured, it appealed to the engineer in me. Its pillars of Diet, Meditation, Vitamin D, Exercise and Omega 3 made solid sense to me. I took it on and have never looked back. The OMS program has given me a blueprint on which to build my recovery. It’s given me something to harness my self-discipline and self-belief to make me better than I was. I’m leaner, stronger and fitter now than I have ever been. I was feeling pretty good after a couple of years on the OMS program and felt like I had MS under control – to the point that I was no longer worried about my future health. I started looking for a new challenge. I had been running a little bit for my OMS exercise (three x 5k a week). It doubled as meditation for me, when I started thinking that a marathon sounded like a worthy goal. I figured I would only ever try one marathon, so I picked the most scenic one in NZ and signed up for the Buller Marathon in 2018. I trained hard, staying within the OMS program, and successfully completed the run, finishing mid-pack. The Buller did not kill me, so I thought for the next challenge I’d aim for three marathons in a year and that I would try to get one done in under four hours. I signed up for the Mt Cook Marathon later in 2018. This time I trained just a little harder and completed the marathon in 3:55! I was right pleased. Still I felt like I needed more of a challenge, plus I suspect I had become slightly addicted to running. Crazy! So now I was a crazy running addict. The idea of running an ultramarathon started to sound sensible. Running off road through the bush and up mountains sounded very sensible. 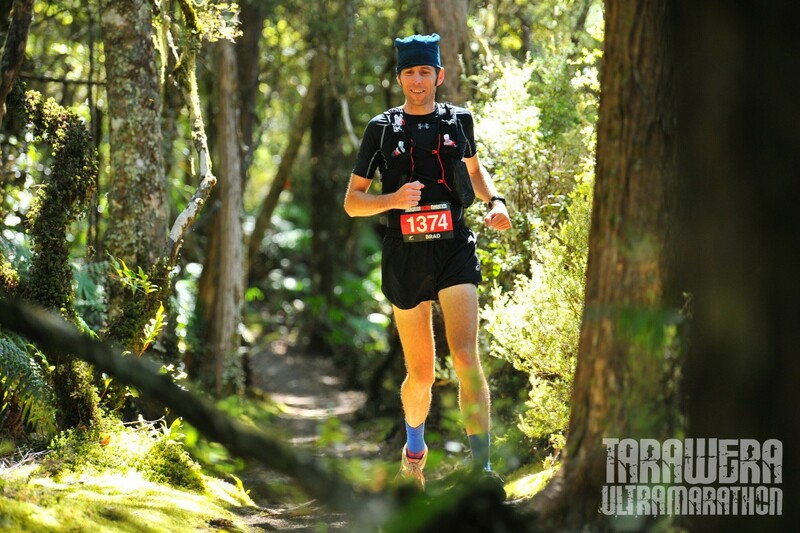 It was at this point that I stumbled across the Tarawera Ultra Trail Marathon. I liked the look of the 102km option! It was a point to point 102km trail race through forests and over 10000ft of cumulative elevation gain. Now that sounded like a challenge! Plus, it was exactly 364 days after my first race – I was on for three in a year. Training for a trail ultra was quite different to training for a road marathon. I now ran five times a week on my local hill trails – no more road work for me. Each weekend I ran ‘back to back’ runs, three to four hours on Saturday afternoon followed by two to four on Sunday morning. 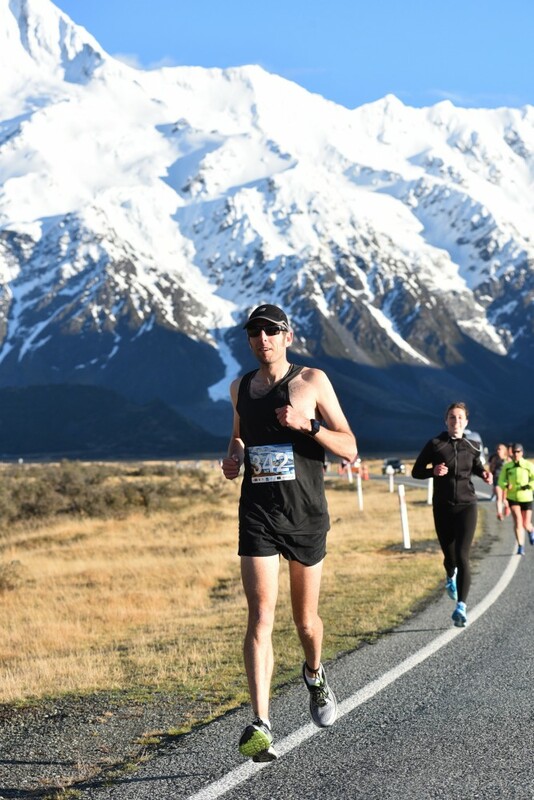 The running was slow and easy on the weekends and doing it on the back of my Mt Cook Marathon meant that I had built up a big volume of training when it came time to race the Tarawera. I did not change what I ate from the OMS diet, I just ate a lot more of it! I even ate during the training runs – mostly nuts and dates to keep up the fuel I was burning. I should note that I do not eat fish or eggs, so my diet is entirely vegan. I use algal oil and flaxseed oil for my omega 3 requirements and lots of wholefoods for everything else. Race day came around pretty quickly, and less than a year after running my first race, I was off on a 102km adventure! It was a really nice feeling to finally get going. Cruising through the bush feeling really strong and free. I’d trained for a long time and knew I was in good shape to do the distance, but you never know how you’ll go on the day so it was pretty exciting all the same. The first 40km was easy running on forest roads, not too much climbing or technical at all. My father gave me a hard time at the 40km aid station for taking so long to get there! It started to get interesting from there. I was off the forest roads now and onto some trail work. Concentrating on foot placement as well as running up and down hills was a little more taxing, then at the 60km point came the ‘big climb’! It was only 1800ft over 6km, but after having run 60km it was quite a slog! Little did I know that the ‘big climb’ was not going to be my biggest challenge of the day. I was still going along reasonably well but when I left the 84km aid station I was limping and my right foot was somewhat painful. It hurt to walk. It hurt to run. It was getting dark. Only 18km to go though. No way am I pulling out now! It got tough for the next 10km. The track was a mix of rough technical trails and hard packed high impact road running. That was when my wife called on my cell phone. She called to encourage me and to tell me that the kids were staying up until I finished the race. ‘That might be 11 o’clock though!’ I said. ‘You’d better hurry up then!’O.K, I thought, time to put the hammer down! Mustn’t keep the kids up. Then, at the 93km mark I hit a 600ft climb on a narrow, technical trail. That was pretty gnarly! At least it was all downhill from there. The last 7km was relatively easy running so I upped the pace, and promptly tripped on a tree root and fell on my face in the dark redwood forest! No damage, so I carried on slowly until I cleared the forest and went pell mell for the finish. It was a really great feeling to cross the line at what felt like a sprint, but was probably a slow jog, in 16 hours and 24 minutes. Slower than I had expected, but the race was harder than I had expected too! After the race my foot was really giving me grief and I was shaking as if I had a fever! That night was mostly sleepless and very hungry – all of the food was downstairs, and stairs were the last thing I felt like attempting after my body had stiffened up post run. I felt better in the morning after my third breakfast and a massive brunch at a nearby cafe. It was funny recognising all of the other very fit looking runners limping in and out of the local eateries! Running the ultra was definitely a worthy challenge for me. So was getting MS, but I feel that with the direction provided by the OMS program, I have overcome it. It might seem strange to say, but I enjoyed the challenge of finding a way forward and applying discipline to get the job done. Running marathons and ultras feels like an extension of the positive action begun with the OMS program. I feel like I’m on a roll now and have more ultras, including a 160km race on the radar, maybe some mountain races? Or a desert? When I was first diagnosed nobody told me there was hope, that you could help yourself. I was given a weekly injection and told how I would decline over the years. There were plenty of wheelchair brochures and pamphlets about how individual bodily functions would fail me. I never believed that. I knew I could fix myself, somehow. OMS gave me the tools to rebuild, to be better than I was. But I did the work myself. You have to be the captain of your own ship. Don’t wait for someone else to fix you. To join you your local OMS Circle visit our Circle pages or if you would like to find out more about becoming an Ambassador in order to start a new circle and support others living nearby with following the OMS Program.